What’s the Ideal Temperature For My Baby’s Room? How much sleep does the average person need? That answer depends on your age. Most of us realize a teenager needs more than an adult, and a newborn requires more sleep than a preschooler. It makes sense, given the activity levels and growth occurring at each stage of life. Babies need lots of sleep. According to the National Sleep Foundation, newborns need 14 to 17 hours per day, while requiring 12 to 15 hours through their first year of life. That’s a lot of sleep. But just like you and me, from the moment they’re born, a baby starts developing their own individualized sleep patterns. And everything that impacts you and me can affect their sleeping arrangements too. The lightness or darkness of a room. The noise levels throughout your home. 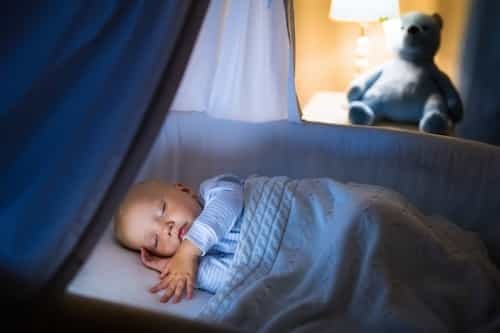 Yes, even the temperature in your Vancouver, Washington home can make the difference between a baby that sleeps well and one that doesn’t. Chances are you have a few friends or family members that are highly sensitive people. They jump or cringe at loud noises. They prefer peaceful places above noisy crowds. Babies are similar. Some are highly-sensitive even before they are born, jumping and moving more when they are in a loud and stimulating environment. That only increases once they are born. You can tell it almost immediately. If they see a change in light, they focus in on it and stay awake. If there’s a change in noise, they either wake up or can’t go to sleep. You start to see the connection between daily activities and emotions. That might not be easy to control when you’re outside of your home. But you quickly realize that part of building a normal routine is helping your baby with sleep training. Everything starts to matter. Adjust one thing, and you can pay the price in the form of your own sleep. And while staying up one night may be doable while consoling your child, even the best of us get cranky when our own sleep patterns are disturbed week after week, month after month. Sensitive children take in everything around them. And that means even the slightest change in temperature can have a real and lasting effect. What’s Better, Heat Or Cold? As a new mom or dad, our natural tendencies lean toward keeping our babies warm. After all, they were warm and cozy inside their mothers for nine months; it’s only natural to think they’d like a place that resembles that feeling. Research shows that might not be true. If a baby overheats, there is evidence that shows they are at an increased risk of SIDS. They don’t need heat any more than you do. If you’re comfortable, they will be too. Dress your child in a similar manner to how you dress. At night, light, comfortable clothes are all they’ll need to stay warm and cozy. However, a baby should never sleep with a blanket; that increases the SIDS risk. Layer their clothing to help keep them at the correct temperature. Generally speaking, whatever temperature level you feel is comfortable will be comfortable for them too. Between 68 and 72 degrees F is a good range here in Vancouver, Washington in both summer and winter. When you’re too warm, sleeping is difficult. You toss and you turn. It’s no different for a small child. When you sleep in a room that’s chilled to the right temperature, you snuggle down and sleep better. According to Sleep.org, the perfect bedroom temperature is somewhere between 60 and 67 degrees F. Your body temperature decreases when you’re lying down to sleep. A colder room can help make this easier. And when you settle down easier, it can allow the quality of your sleep to be better too, affecting the quality of REM sleep. For many parents, the thoughts of wanting to keep their babies safe means keeping them warm. And while that’s important, imperative even, too warm might be restricting the sleep their bodies desperately need. That’s where your HVAC equipment can come into play. Did you ever forget to change the temperature of your home before you climbed into bed at night? You probably noticed it an hour or two later when you awoke sweating. If you don’t have a programmable thermostat, the best time to get one is before you bring your newborn home. This will allow you to automatically change the temperature of your home based on your schedule and your needs. This can be a welcome feature when sleep deprivation kicks in a few weeks after they’re home. Is your home’s HVAC system correctly zoned for every room in your house? Chances are you’ve lived in a home with one room that’s always too cold while another is always too warm. That’s not just a quirk of bad home design. That comes from an HVAC system that isn’t installed and working properly. Your HVAC equipment also controls the air quality circulating throughout your home. And while you might not have thought much about it before you brought your little one home, it’s a big concern now that they are home. Your HVAC equipment plays one of the biggest parts in indoor air quality. If your equipment is in proper working condition, with proper air filtration in place, your air quality isn’t as clean as it could be. That means your little one might be impacted by dust mites, pollen, and other indoor pollutants that make it more difficult to breathe. So if you have any questions about your HVAC system or air quality, especially as concerned parents, just ask. We’ll do what we can to make your baby, and you, rest peacefully.